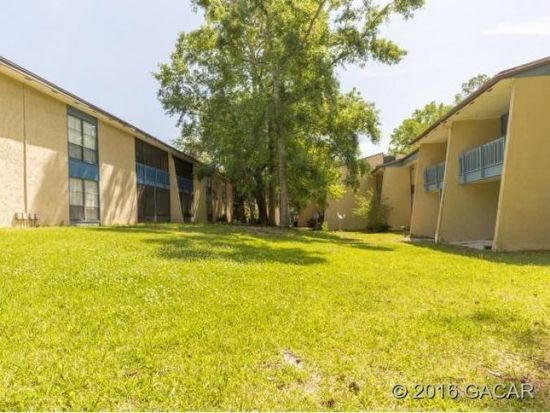 Near the southern edge of the University of Florida campus in Gainesville, Florida, Brandywine Condominiums are a nice option for students looking for convenient access to campus in a serene, wooded setting. As Brandywine Condominiums are within walking distance to campus, students can walk to the Entomology Department in a little over 10 minutes, and the Horticultural School in just a few minutes more. For residents who want to travel a little farther than campus, the 1, 12, 38 and F buses stop within a short distance from the community’s entrance. On the weekends, those who live at Brandywine Condominiums have plenty of options for entertainment. The Florida Museum of Natural History is only a 20-minute walk away, or for those who prefer the arts, residents can take in masterpieces at the Harn Museum of Art which is just about 20 minutes away as well. Movie buffs will appreciate being able to catch the latest block busters at the Regal Cinemas 14 which is a 20-minute ride away on the 12 bus. When hunger arises, residents have ample dining options near them. Students can walk 16 minutes from the community to access Dunkin Donuts for breakfast and coffee before class. A local favorite, Po Boys Seafood and Grill is also under 20 minutes away by foot for those wanting to enjoy a seafood dinner with friends. Brandywine Condominiums offer a number of fun amenities to make their residents feel more at home. Those who live in the community can challenge their roommates to pool at the clubhouse’s pool table, or they can take turns serving on the ping pong table. For residents who enjoy staying active, the complex has a number of options to keep residents in shape. A swimming pool and weight room await them. The community also has a sauna for their residents’ much needed relaxation time. Pets under 15 pounds are welcomed at Brandywine Condominiums, and the community even has a dog park for residents’ furry friends. With the number of amazing amenities and convenient location to campus, residents will love living at Brandywine Condominiums.